Where Are the Four Rivers that Come from Eden? I was talking to a friend about the creation story in the Torah, and he made mention of four rivers that extend out of the Garden of Eden. 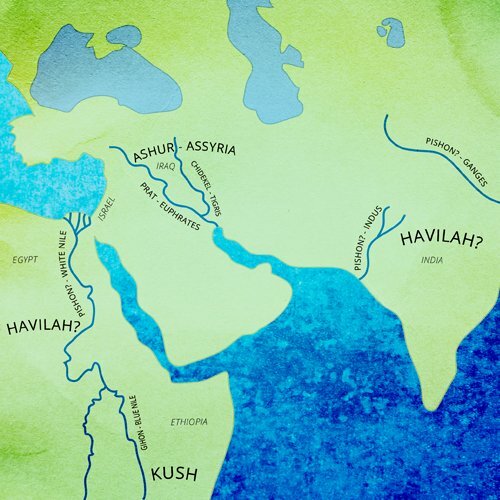 Do these rivers really exist, and if they do, do we know their exact location? If so, can we use the location of these four rivers to determine the whereabouts of the Garden of Eden? As is the case with many other aspects of the creation account in the Torah, the discussion regarding the four rivers is shrouded in mystery.1 The descriptions given in the Torah are rather vague, and there has been much debate throughout the ages regarding their exact identity. A river flowed out of Eden to water the garden, and from there it separated and became four heads. The name of one is Pishon; that is the one that encompasses all the land of Havilah, where there is gold. The gold of that land is good; there is the crystal and the onyx stone. The name of the second river is Gichon; that is the one that encompasses all the land of Cush. The name of the third river is Chidekel; that is the one that flows to the east of Ashur. And the fourth river, that is Perat. What can be clearly deduced from a cursory reading of these verses is that there exist four rivers, Pishon, Gichon, Chidekel and Perat, which all seemingly flow from the same source, the Garden of Eden. Let’s begin with the second two, since their identification is agreed upon almost unanimously. The name of the third river is Chidekel; that is the one that flows to the east of Ashur. The Chidekel is widely accepted as being the Tigris River, which flows from southeastern Turkey through Iraq, and eventually spills into the Persian Gulf. Daniel describes standing on the banks of the Chidekel River while receiving one of his visions during the time when he was in exile in Babylonia.2 Clearly, the Chidekel River is in the region of ancient Babylonia, which is present-day Iraq. Yonatan ben Uziel, a sage who lived in the Second Temple era, translates the word Chidekel into the Aramaic word Diglas.3 Even today, the Tigris is called Dicle in Turkish and Dijla in Arabic. According to this identification, the location described in the verse, Ashur, refers to ancient Assyria, which was centered around the upper Tigris River. And the fourth river, that is Perat. The Perat is identified as the Euphrates River, which runs almost parallel to the Tigris. Together, these two rivers defined a large part of the Fertile Crescent, the cradle of civilization in ancient times. The name “Euphrates” is the Greek version of the Old Persian Ufrātu and the Akkadian Purattu, and even today the river is called al-Furāt in Arabic. While these two rivers are easily identifiable and their location is readily agreed upon, the identification of the other two proves more difficult and is the subject of much debate. The name of one is Pishon; that is the one that encompasses all the land of Havilah, where there is gold. And the gold of that land is good; there is the crystal and the onyx stone. Rashi, the foremost biblical commentator, identifies the Pishon as the Nile River. The word Pishon, he explains, has the connotation of gushing forth and overflowing, and symbolizes the Nile River, which would overflow and irrigate the land of Egypt. Alternatively, the word Pishon is associated with the Hebrew word pishtan, flax, a reference to the ancient Egyptian flax industry, which was watered by the Nile River. According to this view, the area called Havilah refers to somewhere along the Nile region, perhaps Egypt or Sudan. Egyptians were known to have mined gold and precious stones back in pre-dynastic times, especially in the region known in ancient times as Nubia, modern-day southern Egypt and Sudan. The name of the second river is Gichon; that is the one that encompasses all the land of Cush. If these four rivers all flow forth from the Garden of Eden, their identification should give us some clue as to the whereabouts of the Garden. The problem is, however, that there is no central location from which all of these four rivers flow. The Euphrates and the Tigris are in the northeast region, whereas the two Nile rivers are in the southwest. While the exact location of the Garden of Eden cannot be identified, we can infer that it is somewhere within this region, between the Nile River and the Euphrates.11 Some sources go so far as to identify the location of the Garden as being exactly 32 degrees south of Jerusalem.12 The fact that the Garden itself cannot be detected in our world does not mean that it does not take up physical space; it exists on a higher plane of reality and is therefore not detectable by our regular senses. On a concluding note, I thought I’d share with you a spiritual interpretation regarding the four rivers, which has profound meaning and significance in our daily lives. See Targum Yonatan ben Uziel to Genesis 2:14. See Abarbanel to Genesis 2:10. Antiquities of the Jews 1:1:3. R. Aryeh Kaplan, Living Torah to Genesis 2:10. See Rabbi Aaron Marcus, Keset HaSofer, who has a different approach to identifying all four of these rivers. See Nachmanides to Genesis 3:22, and Tosafot to Talmud, Bava Batra 84a. Maamarei Admor ha-Emtza’i (Discourses of the Mittler Rebbe), Vayikra, vol. 2, p. 703. See, for example, Psalms 92:10 and Job 4:11. Commentary of R. Samson Raphael Hirsch to Genesis 2:10. Sefer ha-Maamarim 5737, pp. 53–54. Although there are actually 54 portions in the Torah, the portions of Nitzavim and Vayelech are deemed one portion split into two. See Siddur R. Saadiah Gaon, Keriat ha-Torah, and Chida, Shem ha-Gedolim, Maarechet Sefarim, letter Gimmel. For an elaboration on the spiritual significance of this idea, see Likutei Sichot, vol. 19, p. 298. Sefer ha-Maamarim 5717, p. 236. The Tree of Knowledge - What Really Happened? Yes , Ken it would appear the obvious is overlooked . What cannot be perfect if created by the hand of God . I've waited so long to hear from another what I have believed for so many years . "And Hashem planted a Garden in the East of Eden, and he placed there man which He has formed". 10 A river issued from somewhere in Eden to water the garden, and from there it disappeared into subterranean channels, divided, and surfaced outside of Eden and became four riverheads...."
The flood moved everything. We say the Tigris and Euphrates are in the Middle East. Where are the other 2? The river flowed out of the garden and then divided into 4 headwaters. Their names were.... ok we have two. Where are the missing two? Post Flood. We have no idea. Too many unknowns. Pre Flood we have no idea. Post flood is the same. We have no idea because the flood moved everything. I do not think that was an accident. Personally I think Eden was Heaven on earth and after the fall God closed and separated the two. God is in heaven and sin cannot enter into the presence of God. A really excellent and sufficient explanation. Thank you. Interestingly, we also have indications that when Messiah comes, there will again be large topological changes in the earth. The Mount of Olives will divide in two. The desert will cease to exist as the entire land becomes a well watered plain, with a stream on every hill. The Temple Mount will be raised above the rest of the land, and it will be greatly enlarged. It's two streams will give life to the land, watering the plain and renewing the Dead Sea, which will be full of fish. This is just Israel. What about the rest of the earth? To ‘Ever were born two sons. One was given the name Peleg [division], because during his lifetime the earth was divided. His brother’s name was Yoktan. Maybe the rivers mark the split of the Americas and Euro-Africa, Africa and Asia, Asia and Australia, Australia and Antarctica.